Your strategy is to get more business right? Perhaps better business, those A+ clients you’ve read about. But do you know who yours are? Most of us go into business because we’re good technicians. But being good at business is an entirely different skill set, and marketing is another one again. But here’s the key – we’re all capable of learning when we have the right teacher. Experience is a good teacher – but getting expert advice makes much more sense. Fortunately I live at the pointy end of marketing; that place where the doing needs to be done. So often, it’s a business coach or marketing strategist that is calling me in to help clients deliver to the plan. That’s my favourite place to work – in the land of planning, measuring, and improving on bottom line results. We regularly work with marketing specialists, business coaches, advertising agencies, design houses and SEO specialists. 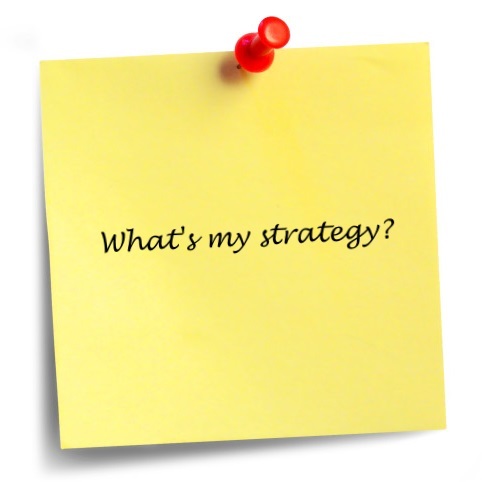 They all agree you need a strategy … and they all help you define yours. So if you’re wondering if a copywriter can help – ask yourself, “what’s my strategy?”. If you have one – get in touch. If you don’t – we can help you get in touch with the resources you need. This entry was posted in Across the Desk, CopyCarats, Marketing Advice on October 2, 2014 by Cara Tipping Smith. This month, I want to introduce you to the Small Business Hub (NZ) if you haven’t already met. 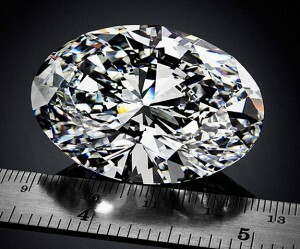 It’s a definite go to site, for all kinds of business information and can save you hours of searching online. Topics which the Small Business Hub (NZ) covers run from Management, Marketing, Social Media, Technology, Forms & Templates, Tools and even Video Libraries (useful if you have a few minutes to kill and want a little education). The site includes a number of free e-books and downloads and links to popular online tools and resources. My recommendation? Take a look. If you like it, bookmark it and sign up to their newsletter (just so you get a friendly reminder every so often, that it’s there). This entry was posted in At the Water Cooler, CopyCarats, Small Business Support and tagged business resources on July 1, 2013 by StudioEleven. Big change for Gmail users and… everyone sending newsletters! Monday’s Herald (July 1st) had a wee article that I want to share. 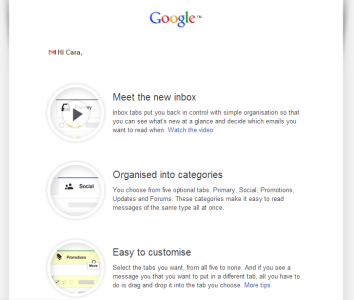 Debbie Mayo-Smith pointed out the new inbox option for Gmail users and it could be a game changer. Not just for Gmail users, but for everyone sending newsletters to their customers. Your emails and priorities automatically sorted. In short, Google has quietly introduced a Gmail inbox configuration which (with drop and drag) makes sorting inbox content dramatically different. Now everyone can automatically weed out the content that they don’t want to see straight away. If, like me, you’ve been automatically assigning newsletters to a separate folder anyway – it just got a whole host easier. If however you’re like most people, who get all their Gmail straight into their inbox, this is likely to be a very welcome change. However, if you’re sending newsletters to customers, this change makes them less likely to be seen! Now more than ever, your newsletters are going to have to stand out from the crowd. Once this inbox shift takes off (and I predict it will), your newsletters could be automatically buried in a separate tab in one of the world’s most used email systems. Read Debbie’s article here. And if you need help to make your newsletter more compelling contact us. This entry was posted in Across the Desk, CopyCarats, Marketing Advice and tagged Google, strategy on July 1, 2013 by StudioEleven. How much information is enough for your writer? Do you know how much information to give your writer? You will have seen our guide on how to give good brief so you’ll already know that more info is better. But what kind of info and how much is too much? The short answer is that you cannot over-brief your copywriter. Last week a colleague send me a draft of his copywriting brief for a group of writers charged with overhauling a very complex website. The group of writers were a mix of internal and external; subject matter and copywriting specialists. He nailed it. And here’s how. He ensured that the goals were clear and they were S.M.A.R.T. goals. He gave the writers a living example of what he wanted. He set clear accountability for content with a sign-off process that ensured the content couldn’t go live without approval. If you’re lucky your copywriter will already be familiar with your industry – especially for technical and tightly regulated industries. But possibly more important is that your copywriter understands marketing – how to get your customers to do what you want. If you have to sacrifice one skill set, get the marketing expert. Technical details and compliance can be reviewed internally, but you need your marketing messages to work. The SMART goals related to things including word count and reading index levels, along with a brief about the tone and feel of the copy. A good copywriter will ask you for information along these lines, or liaise with your printer, graphic designer or web designer to make sure they know what’s required. As my colleague happens to be an excellent copywriter himself (and more) he was able to provide the writers with a before and after example of the kind of writing he wanted. But even if you’re not a writer, you can take a good example of what you want and give it to your writer. That includes other people’s marketing and websites; just be sure to explain to your copywriter why you like it (so they don’t run off on a tangent). Give a clear sign-off process. The clear sign-off process gives the writer the parameters in which to work. It also provides a means to set the time frame and accountability for the content. This in part relates back to industry expertise but essentially it’s just good practice. Be guided by your writer. My colleague asked me if his brief was too prescriptive. It wasn’t. But I wouldn’t have hesitated to point it out if it was. Your copywriter wants to the best job possible for you. You’d be mad not to trust them with enough information to do it. Tell us what you want to know about working with creatives and we’ll do our best to answer. This entry was posted in CopyCarats, Hire a Writer, Working It and tagged cost effective copywriting, good brief, planning on June 30, 2013 by StudioEleven. Automate Google for endless inspiration! Inspiration is aplenty, if you know where to look. One of the best places that works for me is Google Alerts. It’s not perfect but if you manage it well, it’s a rocket fuelled source of business writing inspiration. 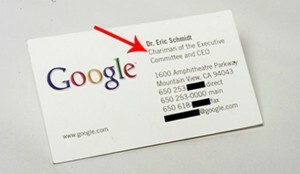 If you don’t have a Google account, you do need to register but it’s simple and free. 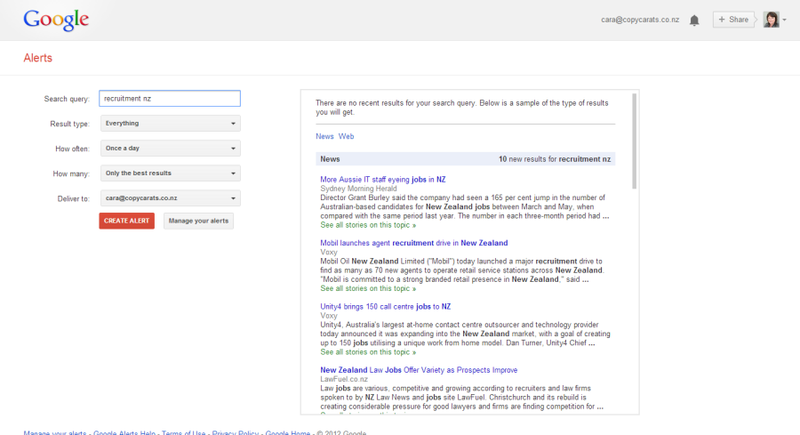 I use Google Alerts for myself as well as for clients, and encourage them to set up alerts for themselves. Here’s why. It’s impossible to stay on top of every industry or sector related story. Certainly I find it impossible to stay on top of Radio, TV and the NZ Herald, let alone LinkedIn, Twitter, Facebook Pages, Google+, Industry Blogs and the plethora of other info sites I indulge in. Store your inspiration for when you need it. Google Alerts, cleverly used means I can quickly access the information I need, and decide what I need to write about or comment on. Don’t get me wrong, it’s not my only way of staying up with my education, but it does happen to be a great way of collecting an in-one-place stream of possible inspiration. Here’s a glimpse at an alert for Recruitment NZ. Choose the settings that suit you best. As you can see, you can choose your settings. Choose the sources you want (e.g. news, blogs, discussions, even videos and books). Choose when how often you want to be updated. Choose the kinds of update results you want. Google takes care of the rest and emails relevant content to you. If you want to see how I manage alerts and other regular emails see my post here. Put your inspiration to work. Basically when I want to write a newsletter topic or business article, I can just dip into my folder of inspiration to see what’s topical. It also means I can proactively contact clients to let them know about conversations that impact on their business. Gain profile on the back of industry news. One of the upsides is that it gives me an opportunity to see what’s going on in my industry and comment (or not) on other people’s input. Not all copywriting has to be long or comprehensive. There are many ways to build a business profile. Google Alerts will definitely give you some inspiration. Test it out. See what works for you. And let us know below. This entry was posted in CopyCarats, Finding Inspiration, Learn to Write and tagged clever words, Google, writers education on June 30, 2013 by StudioEleven. Chunking it vs churning it! If you’re not naturally a writer and have to write for your business, it’s important to give yourself a fighting chance. As with any postponable task, the key is to break it into small manageable chunks that will systematically get you where you want to be. Without context, that last statement gives even me, the horrors. Anyone who’s ever done a time management course is thinking “really?! That’s your best insight?” and who could blame them. So let me show you how to do it, with context and a genuine example. Let’s look at writing a newsletter. What on earth are you going to write about? Probably, because you knew it was coming up, you have a couple of ideas for some of the content. Maybe a link or two? Maybe an industry article? Maybe a thought about something a client said last week. All good. But it’s what you do next that matters most. Do NOT be tempted to just start writing. If you do, you will churn. By churn, I mean you will change sections around, write and rewrite the same article, ditch one idea for another, rewrite the headline seven times and still wind up dissatisfied. STOP and decide what you want to achieve. With your brief in hand, break your newsletter into sections where each section has a purpose or point to achieve. In my case, we have 6. Best research says 5-7 items is about as much as the brain can handle so we have 6 (and yes, these are the 6 topics most requested by clients). Our highly technical chunking tool in action. So for me, I don’t write a newsletter per se, I write 6 mini-articles. See the task is getting easier already! Even then, I don’t write all 6 at once. I write one article, to purpose, until completion. Then it’s done. 5 to go. The task is getting smaller. Satisfaction all round. For this article I only had one purpose; to give you a useful tip on how to write better. So if you are struggling with writing your newsletter this month, stop. Take 10 – 15 minutes to work out the main sections of your newsletter. Give each section a section title and a section purpose. You only have to do this once. The next newsletter will use the same sections and same purposes (until you want to retire or renew them). Now pick one section. Go back to your ideas (links, industry stories, client’s comments) and find one that fits your purpose. Do not change topic. Do not change purpose. Just get the words down for that section and once you’ve finished the article, check your grammar and spelling, and only then give it a title. There you go. It really can be that easy. And as you get better at chunking instead of churning, those articles will start to roll off your fingers with ease. Post your comments below. Meantime happy writing! This entry was posted in CopyCarats, Learn to Write, Writer's Corner and tagged planning, strategy, writers education on June 30, 2013 by StudioEleven. Following on from the 4 Cs which have been our marketing touchstones for years (Clarity, Colour, Cut and Carats) we’ve introduced ‘the 5th C’… educ-C-ation. 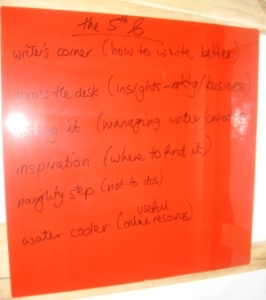 ‘The 5th C’ is your monthly guide to business writing. There’s something for everyone; DIY tips, market knowledge; and the latest and best online resources for business marketing. I know that as a business owner, you don’t always have the budget to outsource. ‘The 5th C’ is designed to help you achieve more on your own. And if writing is not in your DNA, don’t worry – we’re happy to step in when you do need professionals. This entry was posted in CopyCarats, Learn to Write, Small Business Support, Words for Fun and tagged cost effective copywriting, writers education on June 25, 2013 by StudioEleven.